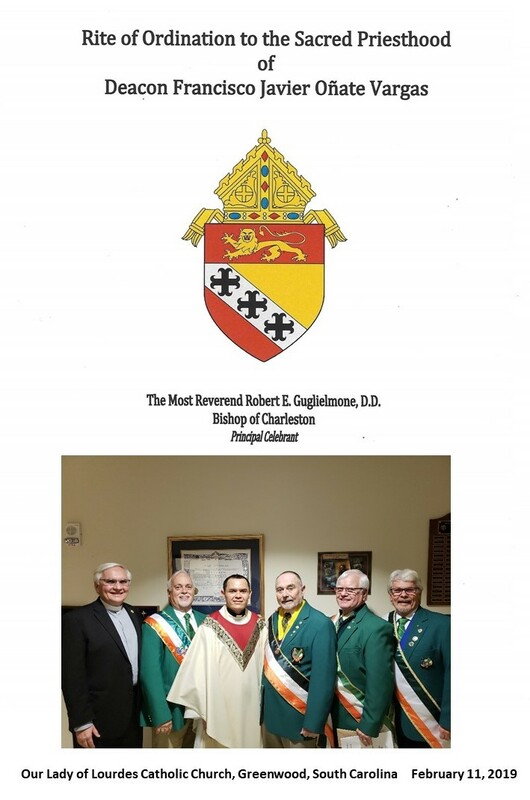 Deacon Francisco Javier Oñate Vargas was ordained a priest by The Most Reverend Robert E. Guglielmone, D.D., at Our Lady of Lourdes Catholic Church in Greenwood, South Carolina on February 11, 2019. Father Vargas' education as a seminarian was followed by the Greenville Division of the Ancient Order of Hibernians and now he serves as a Priest in our diocese. 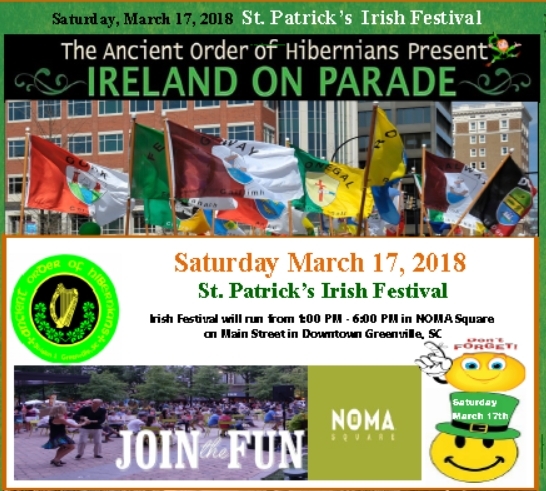 Parade will kick off at 11am from County Square and ends at the festival - NOMA Square - which runs from 12pm to 6pm. 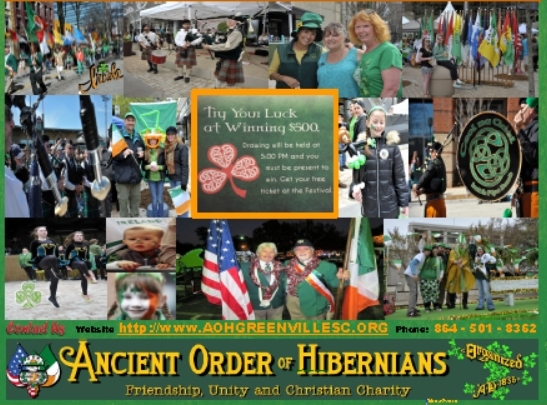 Please join us for our great annual tradition to celebrate Irish heritage. We support the SafeWater NOW project that provides clean drinking water via inexpensive water filters made locally that last at least 5 years for the entire family...a LIFE changer for people in Africa that don't enjoy our comfort of turning on our local facet for clean water. See pics that show the holding container for the filtration system, not in the picture. Water source comes from local ponds and streams where the animals wash, drink, etc, and the filter system provides clean water for cooking, drinking and other needs for clean water. What a Charity can do through individual people for those in need of a basic human need! 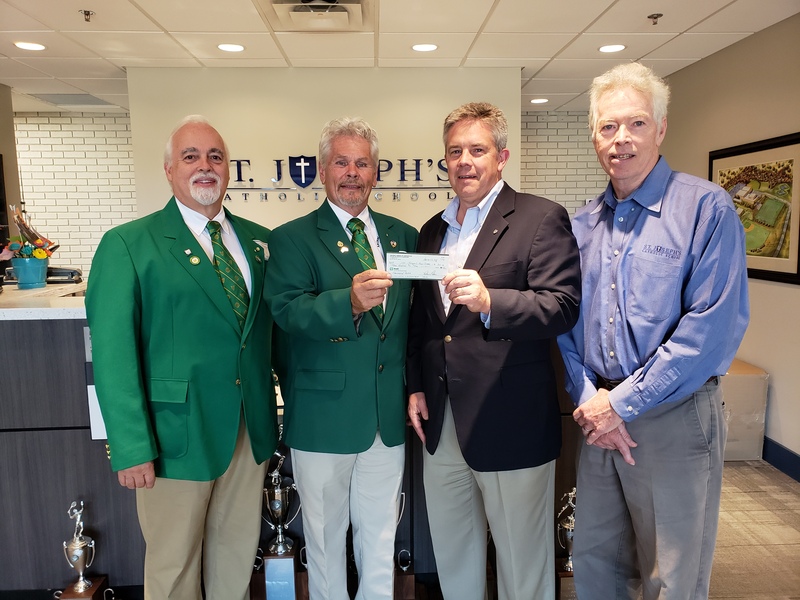 The South Carolina Board of the Ancient Order of Hibernians offers several opportunities for the children and grandchildren of their members, including local Catholic High Schools throughout South Carolina, and in particular, St Joseph's High School located at 100 St Joseph's Drive in Greenville, SC., 864-234-9009. 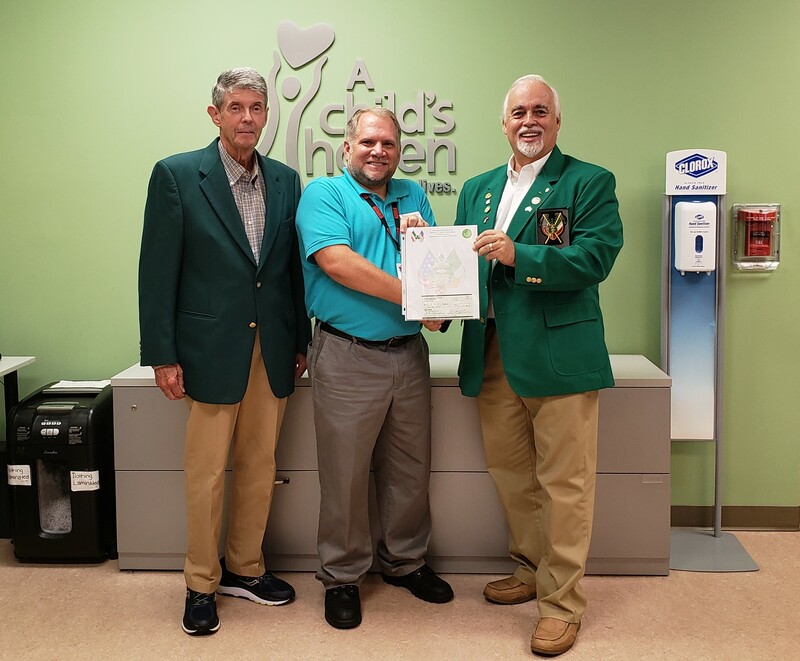 The Ancient Order of Hibernians from the National HQ, State of South Carolina, and the Greenville Division # 1, supports SAFE WATER NOW, Inc. SAFE Water Now, Inc. is a U.S. non-profit providing expertise, services, and resources to solve the problem of unsafe drinking water in Tanzania. 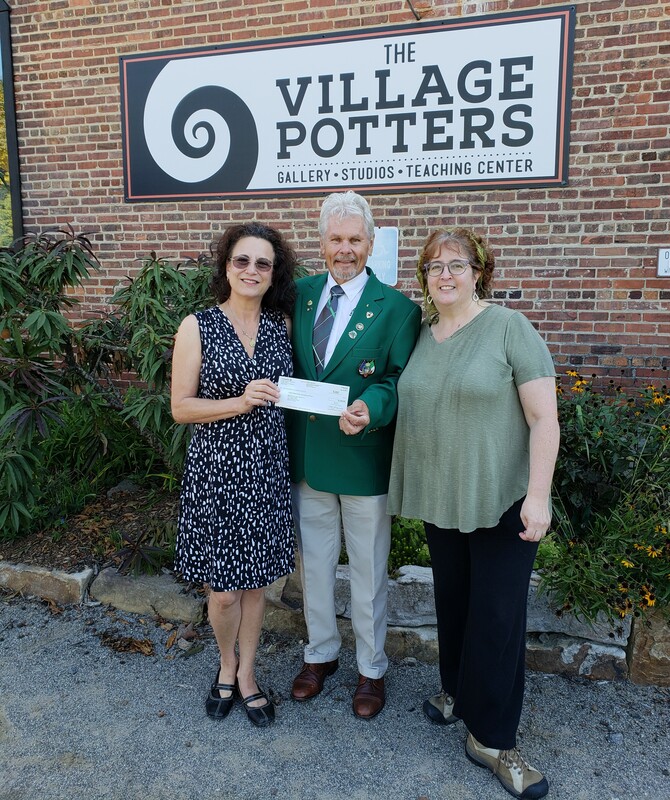 The Village Potters in Ashville, N.C. receives donations, gives direction and expertise for the construction of water filters on site in East Africa. Safe Water Now's manufacturing partner in Arusha, Tanzania produces a high quality, yet affordable, household ceramic water filter. At a purchase price of only $40 USD, the filter produces sufficient safe drinking water for a family for 5 years. Although filters are affordable for many, donations allow filters to be delivered to the most charitable class, usually women and children. 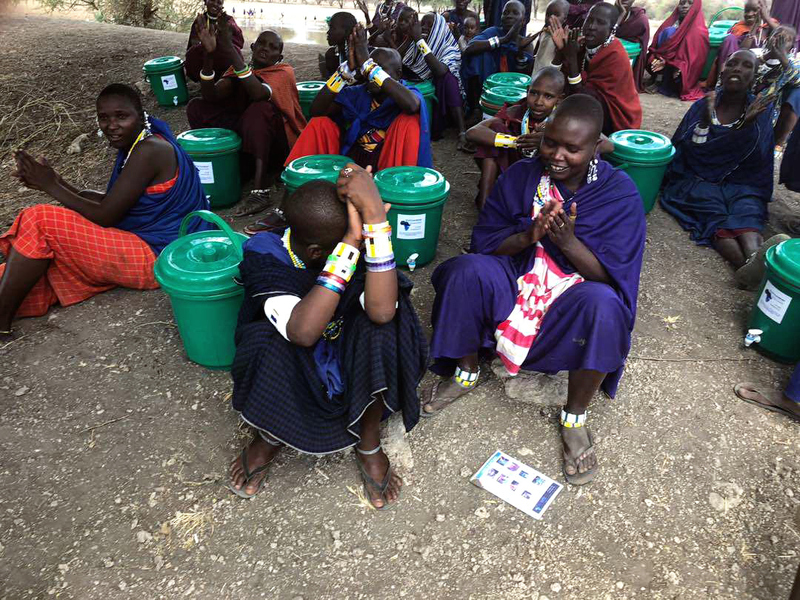 In this case, filters are delivered along with water and hygiene educational workshops. Introducing a new and effective household water treatment to Tanzania also provides economic opportunities for the people of Tanzania. New jobs are created in manufacturing, sales, education, and transportation. SAFE Water Now is an all-volunteer organization committed to saving lives by providing a sustainable solution to the safe water problem in East Africa. 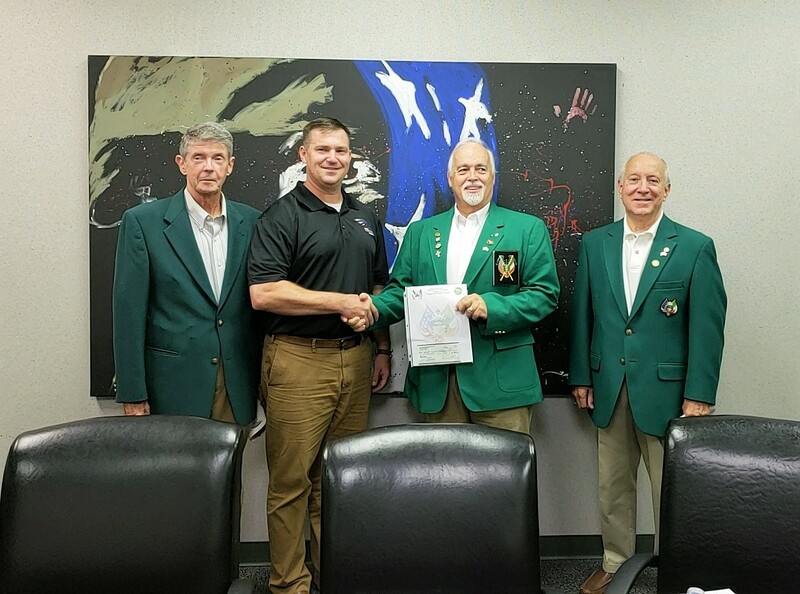 Upstate Warrior Solution is a community based not-for-profit organization that generates quality of life solutions for Upstate veterans, active duty, National Guard, and Reserve warriors and their families. UWS services span the following counties in the Upstate: Greenville, Spartanburg, Anderson, Oconee, and Pickens. 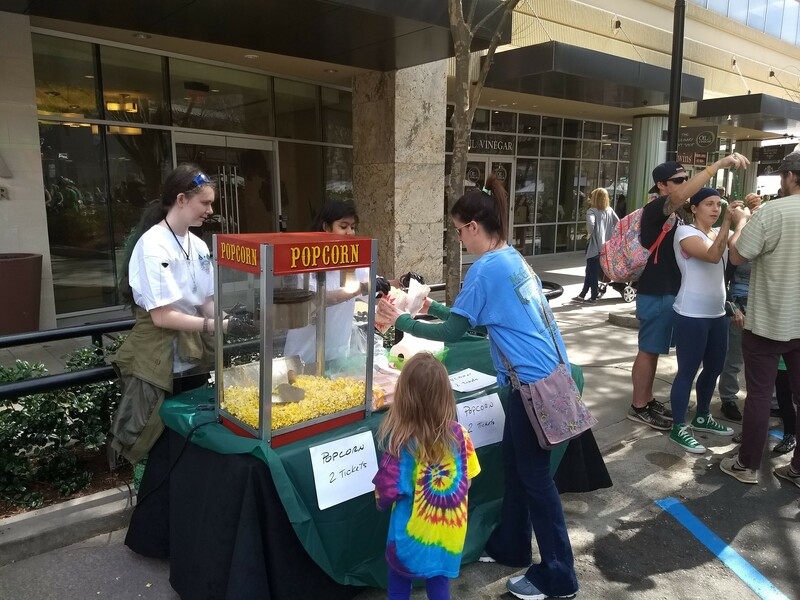 The UWS model is centralized around face to face outreach to the warrior community, and service lines include Mentorship, Healthcare and Benefits, Education and Training, Housing, and Employment. The model does NOT facilitate handouts, but dictates that warrior walk alongside his or her peer mentor, program manager, or social worker in a team environment to generate goals and actionable solutions. A Child’s Haven treats children with developmental delays as a result of limited resources, abuse, or neglect, and provides support and education for both the child and their families. We’re guided by our Executive Director’s vision to ensure that all children in our community are prepared to start school and have families that nurture their success. The Meyers Center turns obstacles into opportunities. 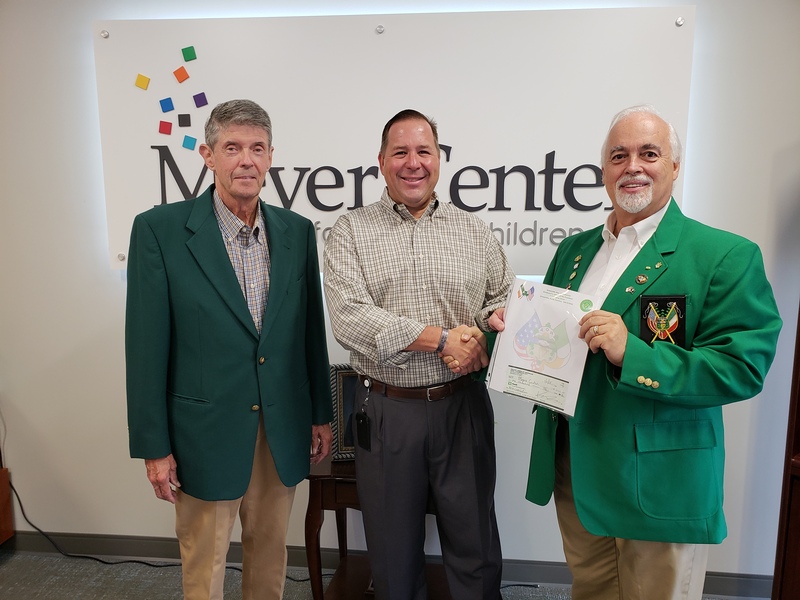 The Meyer Center gives pre-school children the education, therapy, guidance, and care they need to grow and evolve developmentally. Prior to entering the Early Childhood Education Program, each child undergoes a screening and evaluation conducted by Meyer Center therapists and teachers to determine needs and program eligibility. 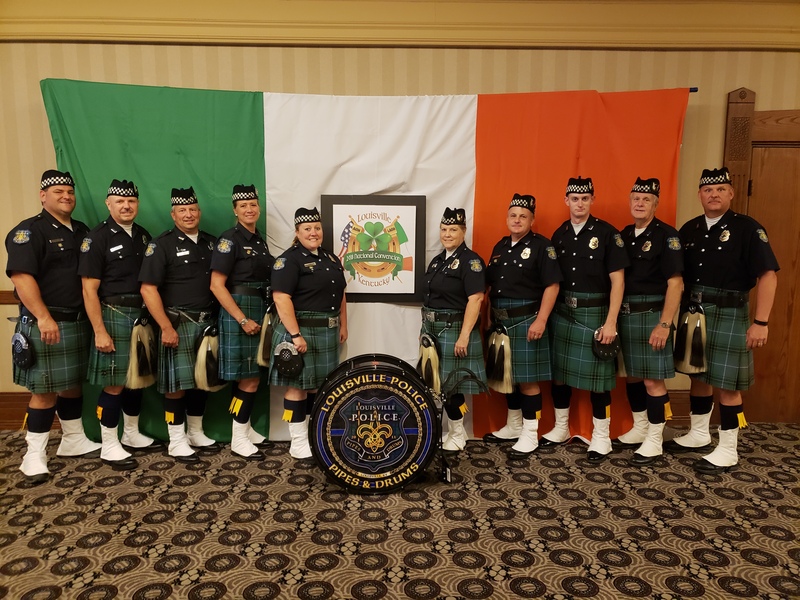 The Louisville Metro Police Department's unit, Pipes And Drums, displayed its talents and Class at our National Convention that was held in July in downtown Louisville, Kentucky. 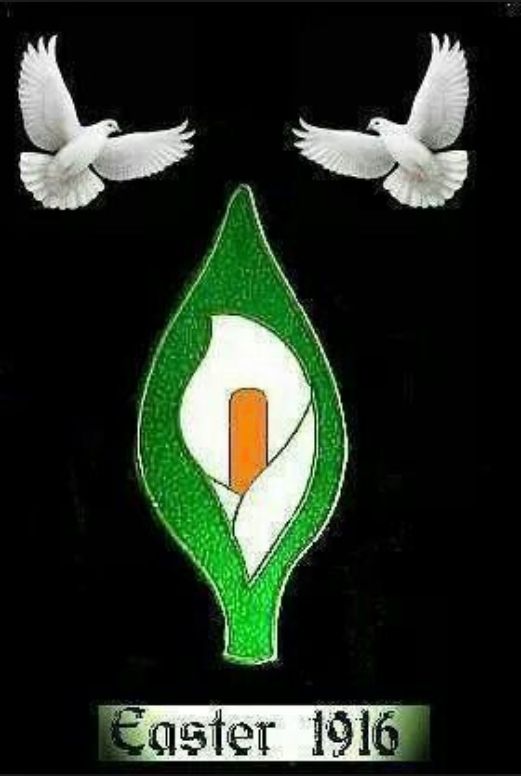 March on IRISH !!! The Leprechaun's Pot of Gold has been found ! Our busy V.P. 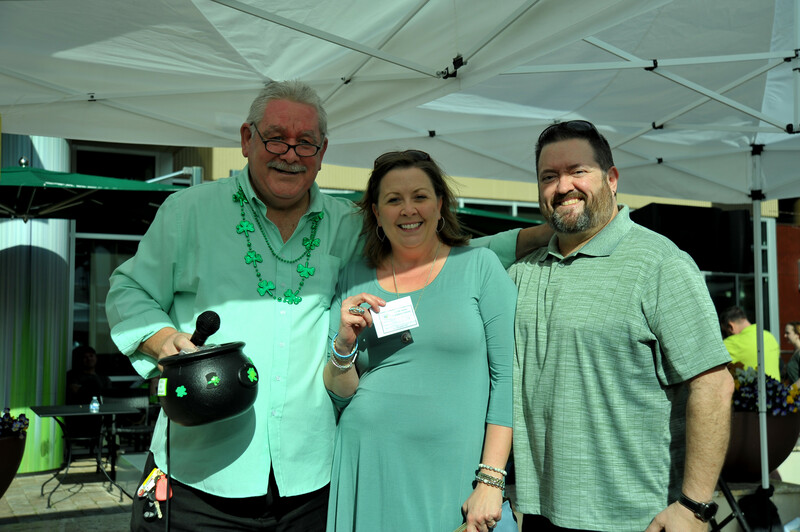 searched the Festival and found the Leprechaun's Pot of Gold and and awards the raffle prize of $ 500 to a lucky family !!! In the midst of all the festivities - UP POPS the Leprechaun !! 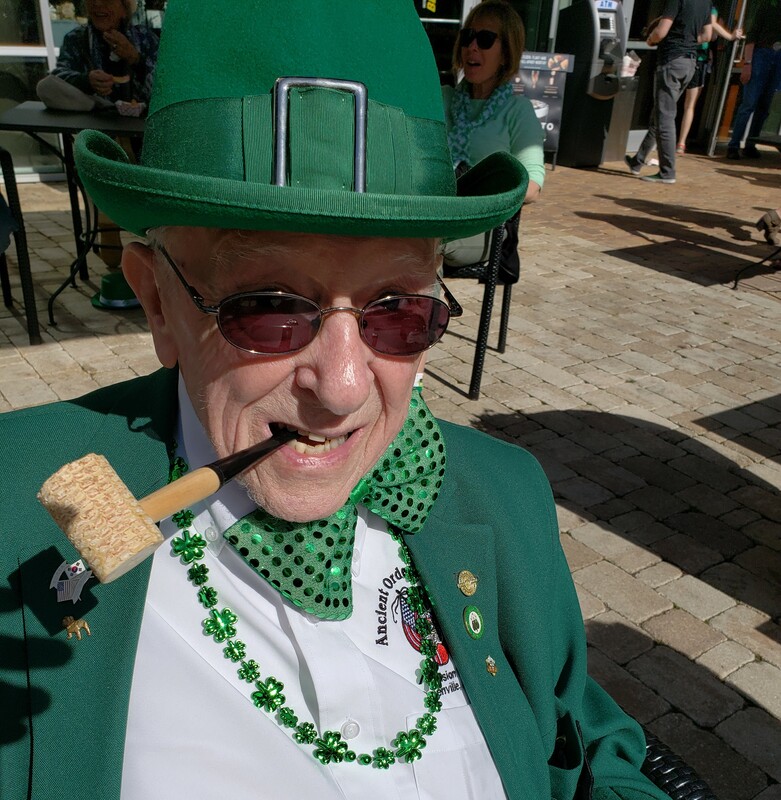 Finally, the Leprechaun has been sighted...........does anyone have a clue where his pot of Gold is? You have arrived at the Dry Slide.............go Around a few times and enjoy. Oh, what a great way to enjoy such a Sunny Day !!! Life is GOOD. Who do I see to go on the Dry Slide? 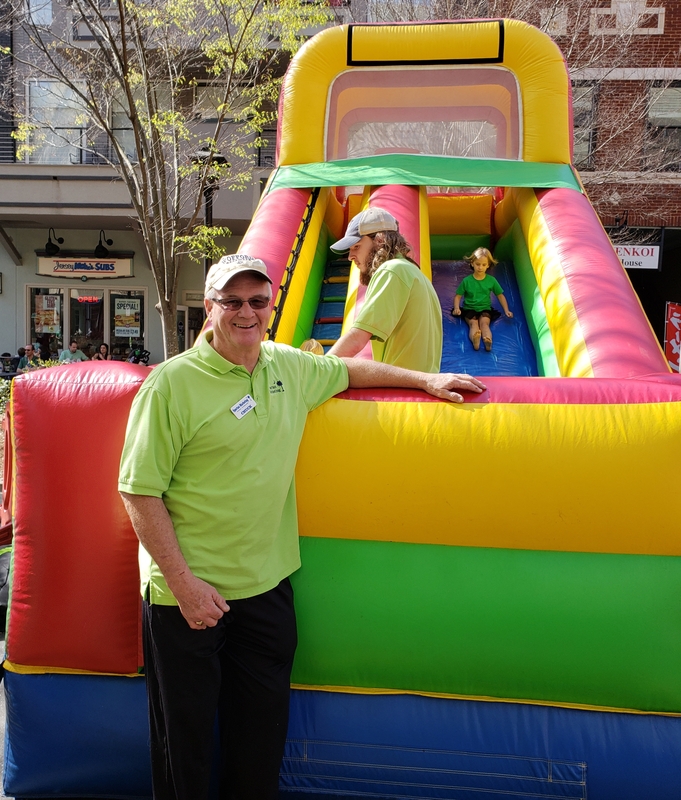 Blue Skye Rock and Fun providing the Inflatables, Chuck and associate are your guides to the Dry Slide ! Gee, those kids are really having fun, wish they would hurry up, I want to be NEXT ! Time out for a bag of popcorn before moving on to the Bouncy House and Dry Slide....what a great day, sun shining, and still more fun. 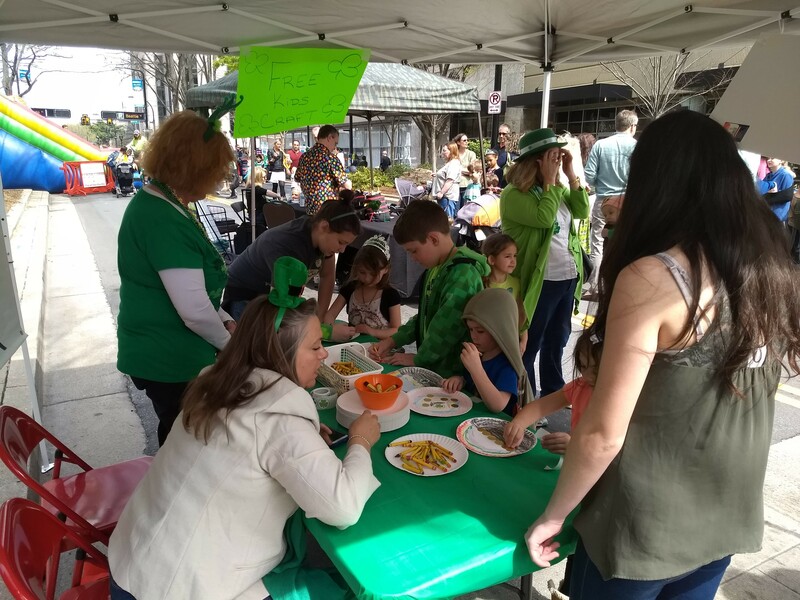 Children at the Festival found many activities of interest including instructors teaching a new art craft, while waiting for Face Painting and balloons created into moving animals! 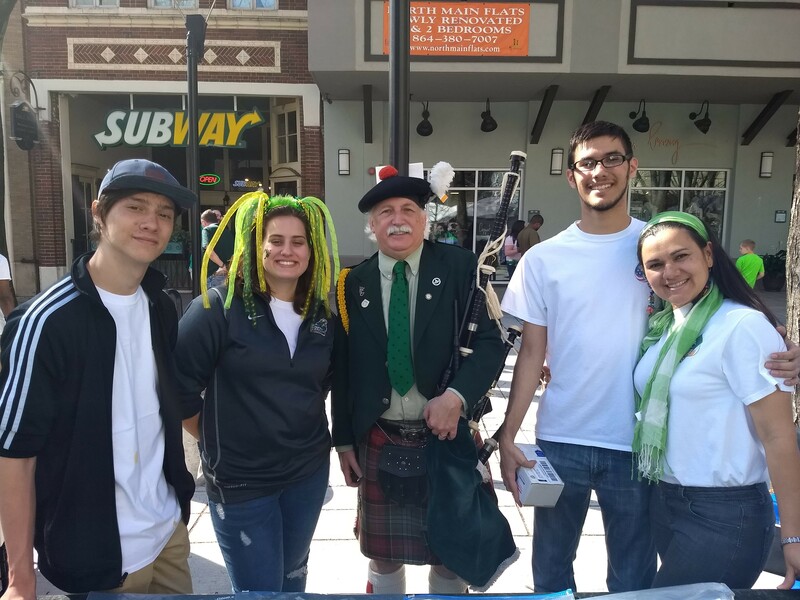 The Venturing Crew 420 donated MANY hours to help make the Festival a success and got a flavor of Greenville's Irishness. 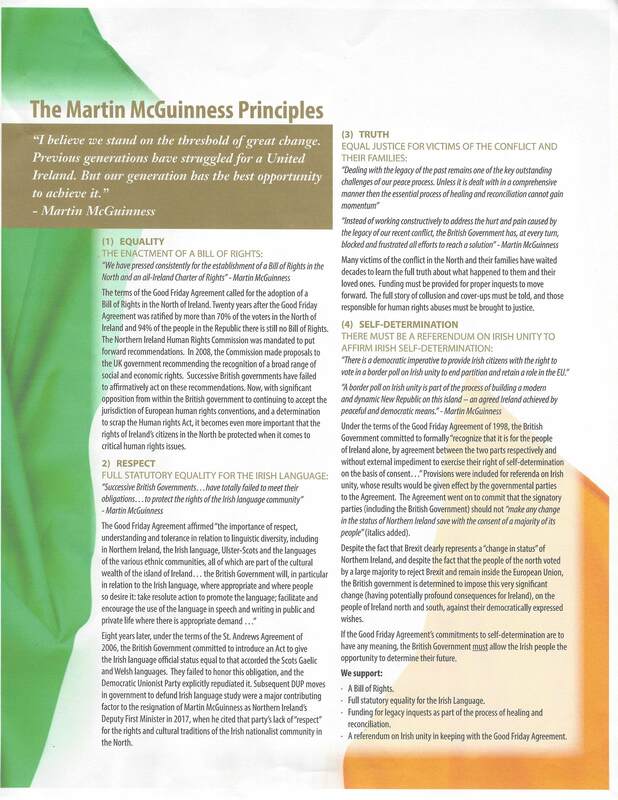 Flying the Colors of the American Flag and the Irish Republic. 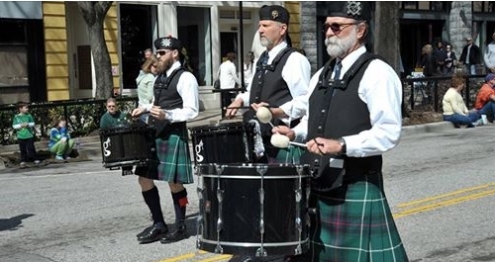 Knights of Columbus joined the ceremony along with members of the AOH and the Cara Club. 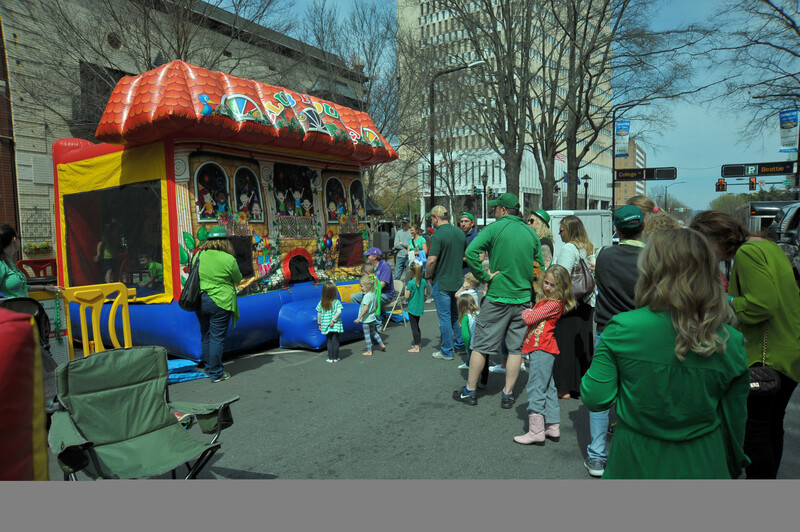 Festival ran from 1:00pm to 6:00pm and then a number of the community headed to Connolly's Irish Pub. 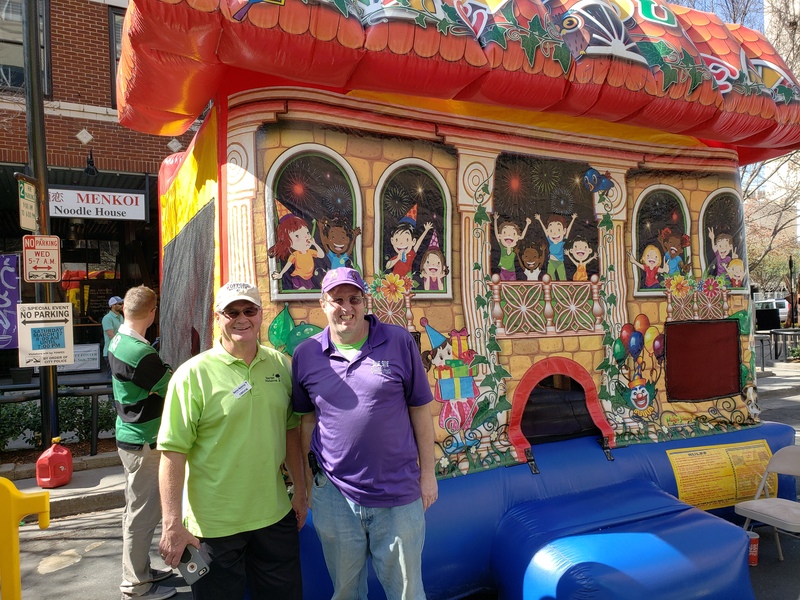 Yes, there was NO Parade on March 11th due to the ALL DAY rain fest that hit Greenville, HOWEVER, we were able to scamble and still had the Festival, on SATURDAY, ST PATRICK'S DAY, March 17, 2018. 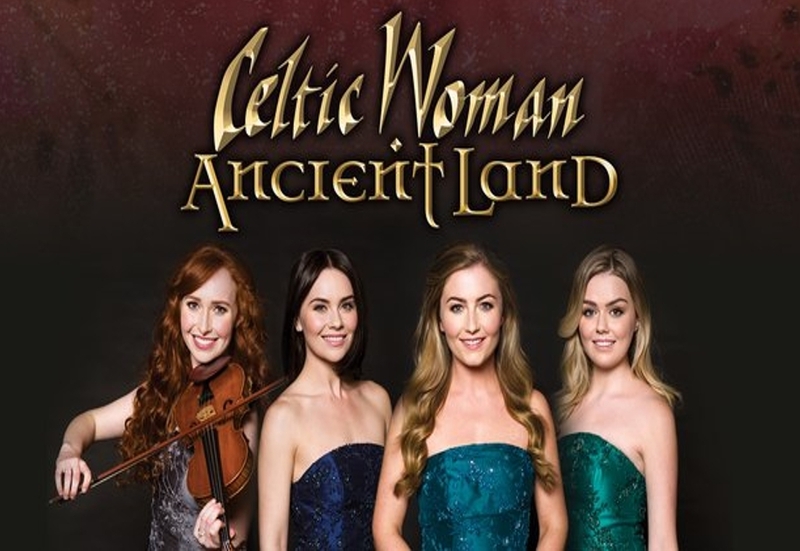 There were people from all walks of life enjoying great Irish music, stories..everyone has got one..and entered their opportunity to win $500....at no cost to you. The winner was a very happy couple that was a bit down on their luck and really needed the prize to provide for their family. Many people took selfies with friends and those costumed in Green for fun and memories. Meanwhile, the children enjoyed the inflatables - Bouncy House and The DRY SLIDE. For the adventuresome there was Face Painting and the Balloon Man provided your favorite animal image. 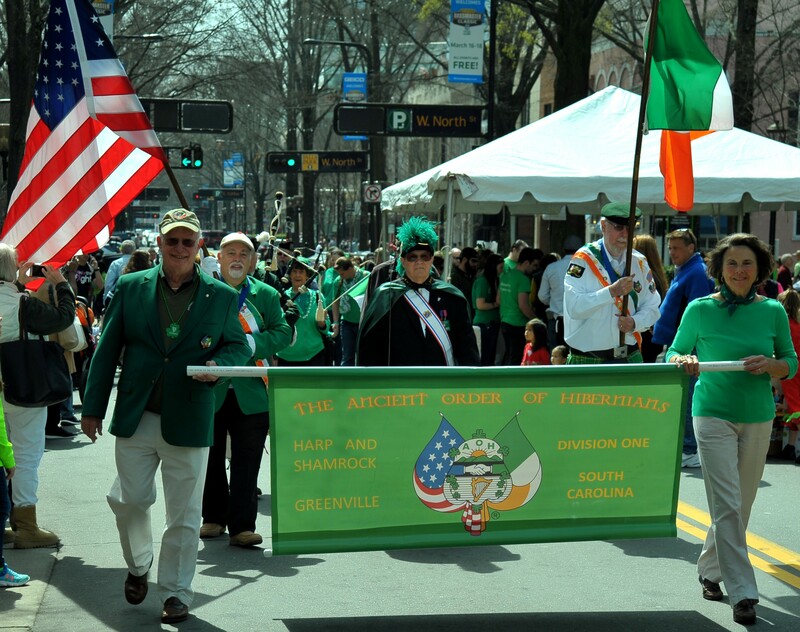 Plan Ahead and Save the Date March 16, 2019, SATURDAY, for the Best in Irish fun in Greenville.